The curly-haired ones, Bianca and Phil, bumble (Bianca) and stride (Phil) their way around the world. 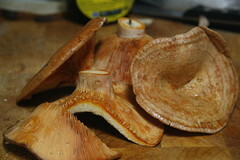 Bianca picked our first wild mushrooms of the season...yum. Just had some with egg and goats cheese on sour dough bread. The rest will go on mushroom pizza tonight.